Trials & Tribulations Of A Brummie Mummy: A New Year, A New You Campaign. A New Year, A New You Campaign. I love a good film and in total honesty if it isn't something I'm watching with the kids it will be a horror flick. I've been challenged to try something new and watch films i wouldn't normally reach for. The following films have been picked for me which are an inspirational bunch. Out of this list I have only watched one of the films and that is "Free Willy". 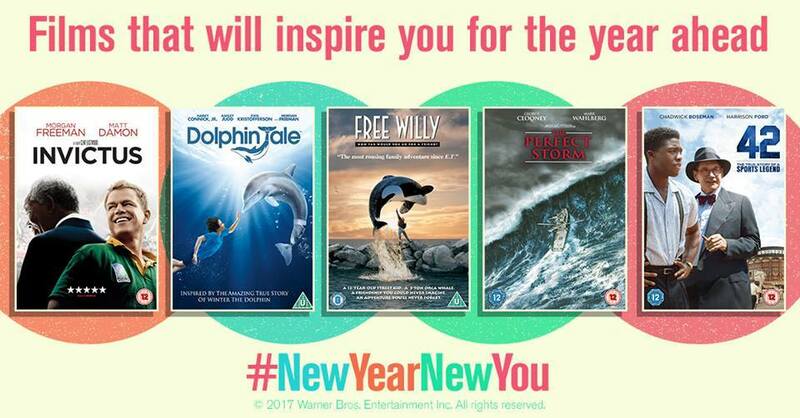 Free Willy was one of my favourite films that I used to watch. As a teen I was really in to dolphins and whales and was hugely fascinated by sealife creatures. So in a round up an Orca whale ( Willy) gets caught by some fisherman and ends up in an aquarium . Meanwhile, a street kid runs afoul of the law and gets caught vandalising the marina, but his social worker gets him off the provided he cleans up his mess at the marina. While there, he befriends the whale and teaches him tricks, something the trainer hasn't been able to do. But when Willy is a dud in front of the audience, the marina owner plans some bad things, and the boy and his friends must try free the whale before it's too late. Invictus Following the fall of apartheid, newly elected President Nelson Mandela faces a South Africa that is racially and economically divided. Believing he can unite his countrymen through the universal language of sport, Mandela joins forces with Francois Pienaar, captain of the rugby team, to rally South Africans behind a bid for the 1995 World Cup Championship. Dolphin Tale A story centered on the friendship between a boy and a dolphin whose tail was lost in a crab trap and has a prosthetic tail fitted. 42 The the powerful story of Jackie Robinson, the legendary baseball player who broke Major League Baseball's color barrier when he joined the roster of the Brooklyn Dodgers. You can win the following films, by clicking below and RT. Good Luck. Labels: A New Year, A New You Campaign.